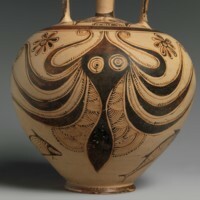 The Terracotta Stirrup Jar with Octopus is a jar about the size of a soccer ball with a long narrow spout and two handles. This makes it suited for carrying and storing liquids easily. On the body of the jar two octopi wrap around, one on the front and one on the back. These octopi and accompanying small fish are stylized with flowing lines to emphasize the movement of water around the animals. The tentacles of the octopi wrap around the jar until they almost overlap so there are no blank faces on the jar. 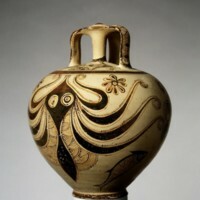 This object was created between 1200-1100 BCE during the Late Helladic Period by the Mycenaeans. During this time and before, the cultures in the Aegean Sea interacted through trade and conflict. Specifically, the Minoans on Crete and the Mycenaeans were combined after the Mycenaeans took control of Crete in 1450 BCE. 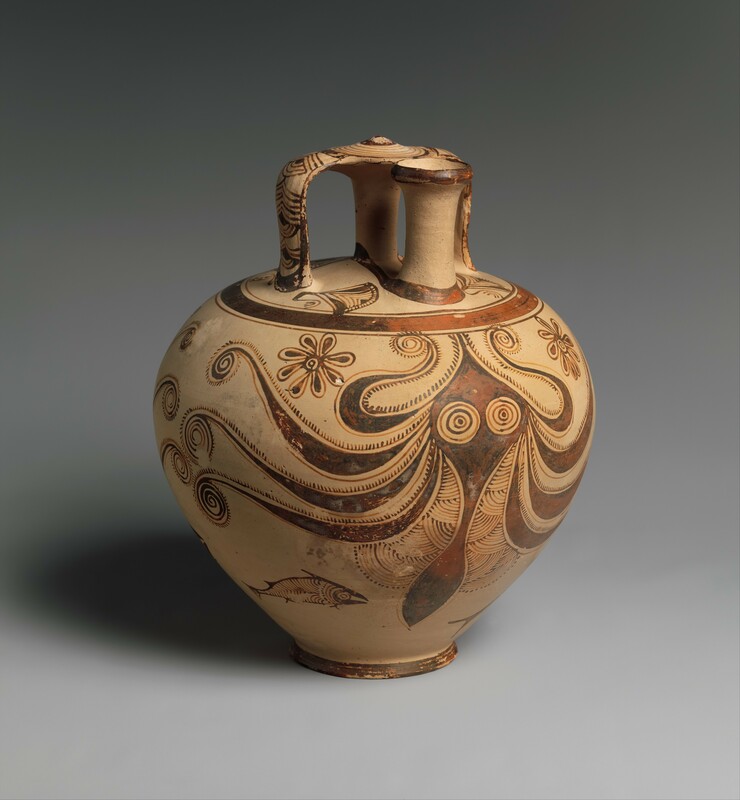 Both of these cultures were likely to use a pottery wheel and marine motifs, which started with the Minoans. 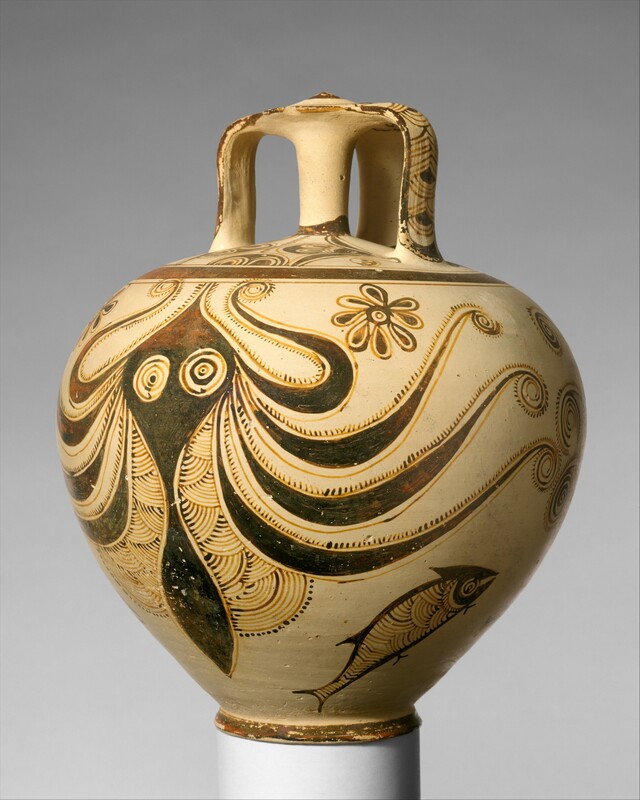 The marine iconography and liquid function reflect the Aegean cultures in which this stirrup jar was made. In addition, the importance of the Aegean Sea trade endows marine and ocean motifs with a sense of wealth and power. 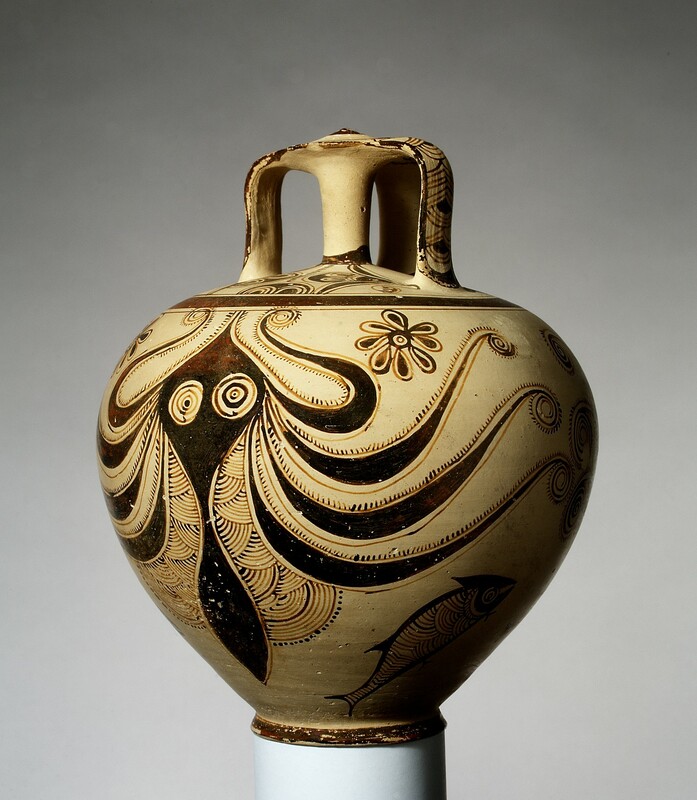 In the context of Janson’s History of Art, there is no direct mention of Mycenaean pottery. 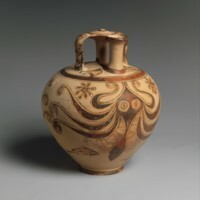 The addition of this work could show how the Mycenaean and Minoan cultures mixed and changed if the Mycenaean jar was compared with figure 4.12. Figure 4.12 is a Minoan stirrup jar from Crete in 1500 BCE (before Mycenaean control). Both jars have octopi and marine motifs. 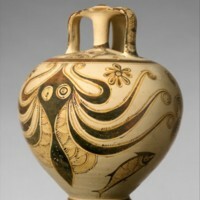 The Minoan jar is much busier with the octopus on an angle and the jar more spherical meanwhile the Mycenaean vessel is less busy with the octopi upright and facing the viewer. The comparison and contrast between these objects would give a sense for how designs influence each other and evolved over time. 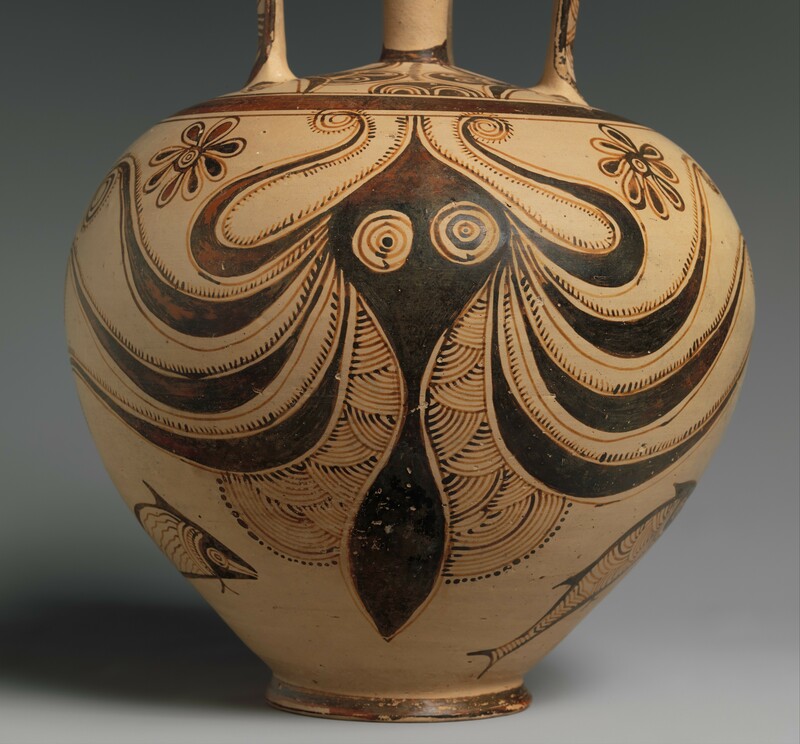 “Terracotta stirrup jar with octopus,” accessed April 22, 2019, http://metsurvey.kenyoncip.org/items/show/14.